Bag an ultra high definition bargain on a great 4K TV. If you're looking for a brilliant 4K TV, then Walmart is an excellent place to check, as it has a huge range of ultra high definition televisions at very competitive prices. 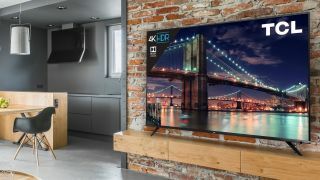 The best 4K TVs at Walmart cover a wide range of sizes, from 32-inch TVs that are great for guest rooms, to 55-inch 4K TVs for the lounge, or even monster 65-inch and 75-inch displays for truly immersive entertainment to rival your local movie theater. There are a lot of things you need to consider when buying a 4K TV from Walmart. Screen size is the obvious one, as you don't want to buy a TV that will swamp the room it's intended for (unless that's what you're going for). You should also think about the number of ports the TV has, especially HDMI. The best 4K TVs offer a wide range of ports for you to plug all your devices into. Look for HDR (high dynamic range) support as well. This is technology that brings improved contrast and colors to 4K footage, and can make all the difference to image quality. Budget 4K TVs will often not have this feature, in order to keep the price down. Because of the wide range of 4K TVs on offer at Walmart, it can be tricky to pick the best one that suits your needs. And that's where this guide comes in. We've hand-picked the best 4K TVs currently on sale at Walmart, and we'll clearly explain why each TV should be worthy of your consideration. The TCL 55R617 is our pick of the best overall 4K TV at Walmart. It offers some excellent features and very good image quality, while also not being too expensive at all. The TCL 6-Series is the best TV you can possibly get in this price range. Its performance-per-dollar is unmatched, and the picture quality – despite a few minor flaws – will truly impress you. It features Dolby Vision and Roku TV for streaming media (two features you'd expect to find only on far more expensive TVs), and also boasts HDR, something many budget 4K TVs don't have. For the price, this is a very impressive 4K TV. If you've got a bigger budget, then the Samsung QN65Q9FN is our pick of the best 4K TV you can buy from Walmart. Sure, it's expensive, but you are getting a large 65-inch 4K TV with exceptional image quality, thanks to Samsung’s QLED technology. It makes images even brighter and more colorful than previous Samsung TVs, and features Full Array Local Dimming rather than edge-lit LED lighting for seriously impressive images. It also supports HDR10+ and Q HDR EliteMax – what Samsung bills as its maximum High Dynamic Range experience that’s exclusive to the Q9FN series – making it the best choice for 4K TV if you can afford it. The Samsung UN55NU8000 is a brilliant mid-range TV that strikes a good balance between price and performance. It's not too expensive, but it offers bright, beautiful colors and a HDR+ mode. It features the latest version of Samsung's TV OS, which is found on much more expensive TVs (like the Samsung QN65Q9FN above), and it handles gaming really well thanks to its low input lag. This is definitely a 4K TV that punches above its weight considering its mid-range price. If you're after a 4K TV for a rock bottom price, and you don't mind missing out on features such as Smart TV apps and HDR, then the RCA RTU4300 is a real steal. For under that magic price of $200, you get a 43-inch 4K TV that might not give you the most impressive home cinema experience, but does a fine job as a second TV to place in a bedroom. As long as you keep your expectations in check with this ultra-cheap 4K TV, you won't be disappointed. If you're looking for a 55-inch 4K TV, then this is a very good choice from Walmart. The UN55NU6900 comes with the build quality we've come to expect from Samsung, while also keeping the price low. Picture quality is good considering the price, and it supports local dimming and a high contrast ratio that helps images look good. HDR support is also included, which is a nice plus at this price point, though it's not as impressive as more expensive TVs, and viewing angles are narrow. Gamers will also appreciate the low input lag. The best all-round 4K TV at 65-inches is this brilliant LG 65SK8000PUA. When you're buying a screen this big, you want to make sure that it has the image quality to do the size justice, and this TV manages that without being prohibitively expensive. It can't compete with 65-inch sets costing $2,000 and above, but it doesn't set out to. This is a very capable, large-screen ultra high definition TV with plenty of features. It doesn't go as bright as some other sets, but for most people that won't be an issue. Yet another Samsung on our list of the best 4K TVs from Walmart, but what can we say? We really like the Korean company's TVs. If you're looking for a large (and we mean very large) 4K TV, then this 75-inch beast is our pick. The Samsung QN75Q6FN offers brilliant image quality, a gorgeous, thin bezel design and plenty of HMDI inputs. It also has Bluetooth and Wi-Fi built in, and it offers a variable refresh rate as well thanks to FreeSync support. Vizio is a brand known for cheap TVs that offer features and image quality that can rival more expensive models. Walmart has a wide range from this brand, but in our opinion the best Vizio 4K TV on sale at Walmart is the Vizio D55x-G1. This is a 55-inch mid-range 4K TV that offers some excellent features for a very tempting price. It has three HDMI ports, so you can plug in plenty of devices. It also has Chromecast built in, allowing you to install various apps such as Netflix and Spotify. Sony produces some exceptional 4K TVs, though they are often quite expensive. The Sony Bravia XBR55A9F is our pick for the best Sony 4K TV at Walmart – but it comes at quite a high price. If you can afford it, then you'll be blown away by the image quality on display here. This is a TV that has been carefully engineered to provide best-in-class image quality and supports HDR, Dolby Vision, IMAX Enhanced and other impressive technology. It also works with Google Home and Amazon Alexa voice assistants.